With Valentine’s Day just round the corner, you would think this cold weather could chill even the warmest of hearts. When I look out across the back garden, a shadow of its summer self, I sometimes wonder how nature can come back fighting after a winter beating, with singing birds, blooming flowers, an awesome array of colours. Yet, with the sprinkle of snowdrops growing each and every day, it’s clear spring is on its way. Time is short, and I need to ready the allotment in anticipation of the new season’s arrival. As much as the polytunnel has been a huge success, last year it did become overshadowed by tall grass and brambles. This weekend, it was time to take out the secateurs and cut it all back. 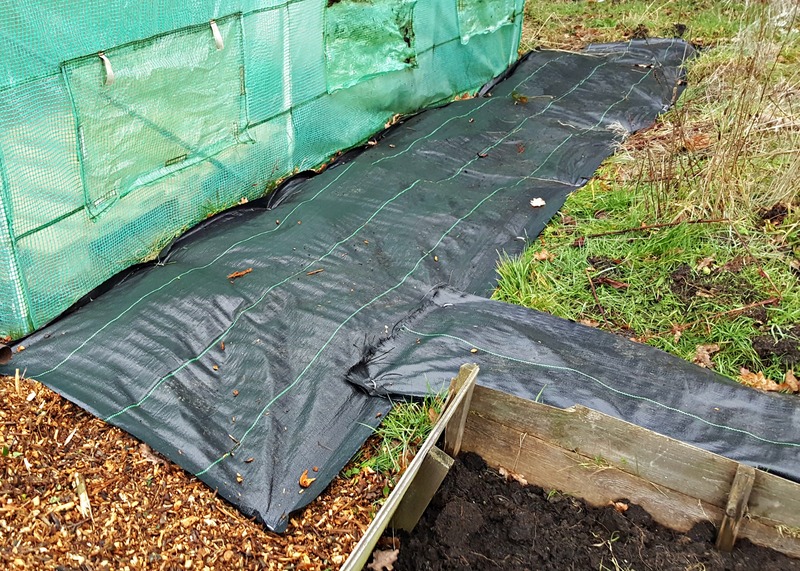 With the area cleared, I surrounded the polytunnel with a weed control ground membrane. Hopefully, there will soon be another delivery of wood chippings which I’ll place over the top to create a path. It won’t stop the problem, but it should help alleviate it. The dormant season is a great opportunity to prune back apple trees and gooseberry bushes and to plant raspberry canes and young tree whips. For me, it was time to split a growing perennial on the rhubarb bed. A few years ago I received three plug plants in the mail. They were a freebie, and with no name or description, I planted them in the rhubarb bed and hoped for the best. 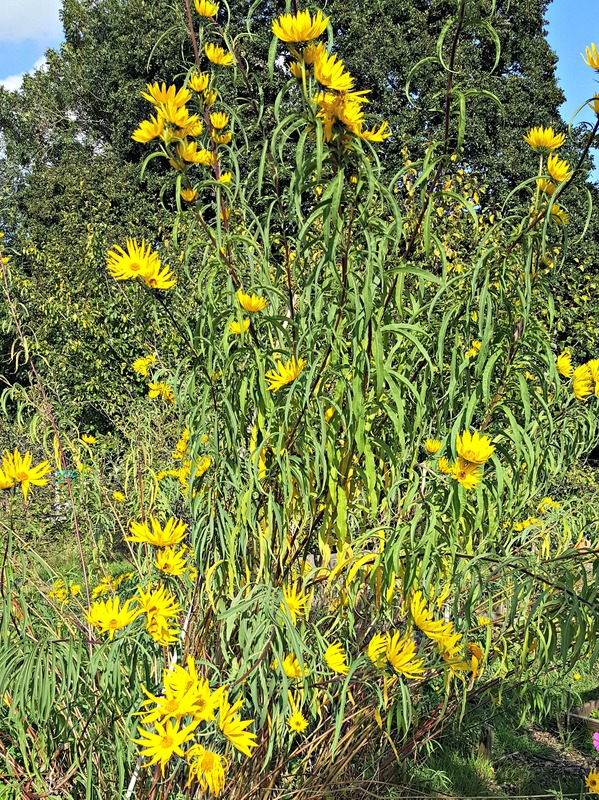 By late summer they had grown over six-foot and were covered with little yellow flowers. They turned out to be Maximilian Sunflowers (Helianthus maximiliani). Now as wonderful as this plant is, it does dominate an area. In the last few years it has taken over the rhubarb patch and is blocking a path. I would re-plant it in the back garden, but as it’s north facing, this would only create more shade. 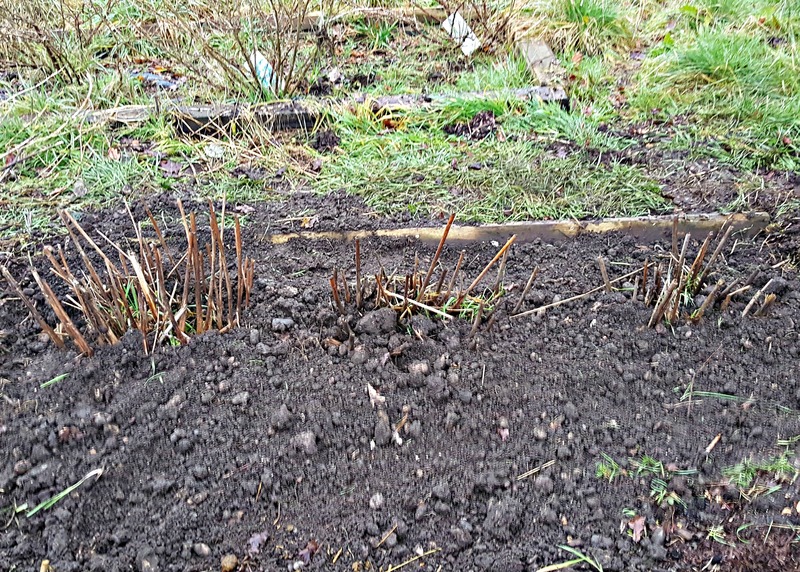 Putting spade to soil, I dug up the sunflower rhizomes, and replanted them at the rear of the rhubarb bed, which I extended, and at some other locations across the allotment. Not only will we get to enjoy them again later this year, but they’ll act as a windbreaker. On the subject of rhubarb. If you’re a lover of this vegetable, like I am, now’s the time to plant new crowns. Or dig-up old crowns, split them and re-plant. They don’t need much looking after, but you won’t be able to harvest any rhubarb for a year; the plants need this time to bed-in and grow. When you do get around to harvesting, twist off the stalks, don’t cut them. Twisting them clean helps to reinvigorate the crown. 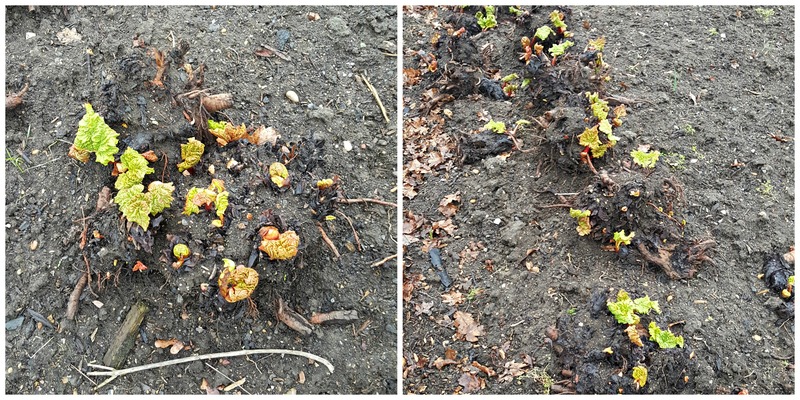 Apart from keeping it weed free, watered and mulched over winter, rhubarb tends to look after itself. It looks great on the plot and can feed you for years. Of course if you have a wonderful wife like I do, she might even create some fantastic bakes with it, to keep you happy, fat and full! So whatever you’re thinking of doing this Valentine’s Day, stay warm. If you’re feeling romantic, I hear baking something for your partner is the quickest way to their heart. Did I tell you all how wonderful my wife is? Next Happy Birthday to Us! Good luck on getting some baked goods. Do you eat the Helianthus tubers? I don’t believe they are as popular as Jerusalem artichoke but apparently are edible. Thanks Mark! I haven’t tried the sunflower tubers, but I had heard they were edible. Maybe this is the week!